A look at the landing legs SpaceX is mounting on its Falcon 9 rocket for the company's next cargo mission to the International Space Station, which is slated to launch on March 16, 2014. 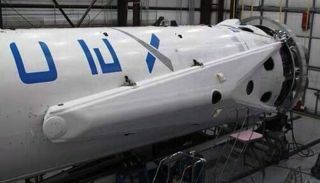 The private spaceflight company SpaceX is strapping landing gear onto the rocket that will launch the company's unmanned Dragon cargo capsule toward the International Space Station next month. Putting landing legs on the Falcon 9 rocket, which is slated to blast off on March 16, marks another step in SpaceX's quest to develop a fully reusable launch system. But current plans don't call for the Falcon 9 to actually touch down on the legs after next month's liftoff, said SpaceX founder and CEO Elon Musk. SpaceX holds a $1.6 billion contract to make 12 robotic supply runs to the space station for NASA using Dragon and the Falcon 9. The company has already completed two of these flights successfully; the March 16 flight will initiate contracted mission number three. But the company's ambitions extend far beyond low-Earth orbit. Musk has said that he established SpaceX primarily to help humanity become a multiplanet species, and he hopes the company plays a prominent role in getting a Mars colony up and running. One key to making such big dreams a reality is developing a fully and rapidly reusable launch system, which Musk has said could lower the cost of spaceflight by a factor of 100. Toward that end, SpaceX has been testing a reusable rocket prototype called Grasshopper, which has a made a series of higher and more complicated flights over the past year and a half. While SpaceX officials celebrated the re-lights as a major milestone, the Falcon 9 did not end up making a soft touchdown in the ocean after successfully delivering its payloads (Canada's CASSIOPE space-weather satellite and three smaller spacecraft) to orbit that day — perhaps because the rocket was not outfitted with landing legs. "This particular stage was not equipped with landing gear, which could have helped stabilize the stage like fins would on an aircraft," SpaceX officials wrote in an update two weeks after the Sept. 29 flight. "The stage ended up spinning to a degree that was greater than we could control with the gas thrusters on board, and ultimately we hit the water relatively hard."